Transcription factor MafG is a bZip Maf transcription factor protein that in humans is encoded by the MAFG gene. 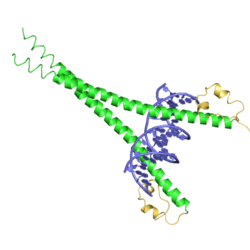 MafG is one of the small Maf proteins, which are basic region and basic leucine zipper (bZIP)-type transcription factors. The HUGO Gene Nomenclature Committee-approved gene name of MAFG is “v-maf avian musculoaponeurotic fibrosarcoma oncogene homolog G”. MafG was first cloned and identified in chicken in 1995 as a new member of the small Maf (sMaf) genes. MAFG has been identified in many vertebrates, including humans. There are three functionally redundant sMaf proteins in vertebrates, MafF, MafG, and MafK. MafG has a bZIP structure that consists of a basic region for DNA binding and a leucine zipper structure for dimer formation. Similar to other sMafs, MafG lacks any canonical transcriptional activation domains. MAFG is broadly but differentially expressed in various tissues. MAFG expression was detected in all 16 tissues examined by the human BodyMap Project, but relatively abundant in lung, lymph node, skeletal muscle and thyroid tissues. MafG gene expression is induced by oxidative stresses, such as hydrogen peroxide and electrophilic compounds. Mouse Mafg gene is induced by Nrf2-sMaf heterodimers through an antioxidant response element (ARE) at the promoter proximal region. In response to bile acids, mouse Mafg gene is induced by the nuclear receptor, FXR (Farnesoid X receptor). Because of sequence similarity, no functional differences have been observed among the sMafs in terms of their bZIP structures. sMafs form homodimers by themselves and heterodimers with other specific bZIP transcription factors, such as CNC (cap 'n' collar) proteins [p45 NF-E2 (NFE2), Nrf1 (NFE2L1), Nrf2 (NFE2L2), and Nrf3 (NFE2L3)] and Bach proteins (BACH1 and BACH2). sMaf homodimers bind to a palindromic DNA sequence called the Maf recognition element (MARE: TGCTGACTCAGCA) and its related sequences. Structural analyses have demonstrated that the basic region of a Maf factor recognizes the flanking GC sequences. By contrast, CNC-sMaf or Bach-sMaf heterodimers preferentially bind to DNA sequences (RTGA(C/G)NNNGC: R=A or G) that are slightly different from MARE. The latter DNA sequences have been recognized as antioxidant/electrophile response elements or NF-E2-binding motifs to which Nrf2-sMaf heterodimers and p45 NF-E2-sMaf heterodimer bind, respectively. It has been proposed that the latter sequences should be classified as CNC-sMaf-binding elements (CsMBEs). It has also been reported that sMafs form heterodimers with other bZIP transcription factors, such as c-Jun and c-Fos. sMafs regulate different target genes depending on their partners. For instance, the p45-NF-E2-sMaf heterodimer regulate genes responsible for platelet production. Nrf2-sMaf heterodimer regulates a battery of cytoprotective genes, such as antioxidant/xenobiotic metabolizing enzyme genes. The Bach1-sMaf heterodimer regulates the heme oxygenase-1 gene. In particular, it has been reported that Bach1-MafG heterodimers participate in the hypermethylation of genes with CpG island promoters in certain types of cancers. The contribution of individual sMafs to the transcriptional regulation of their target genes has not yet been well examined. Loss of sMafs results in disease-like phenotypes as summarized in table below. Mice lacking MafG exhibit mild neuronal phenotype and mild thrombocytopenia. However, mice lacking Mafg and one allele of Mafk (Mafg−/−::Mafk+/−) exhibit more severe neuronal phenotypes, severe thrombocytopenia and cataracts. Mice lacking MafG and MafK (Mafg−/−::Mafk−/− ) die in the perinatal stage. Finally, mice lacking MafF, MafG and MafK are embryonic lethal. Embryonic fibroblasts that are derived from Maff−/−::Mafg−/−::Mafk−/− mice fail to activate Nrf2-dependent cytoprotective genes in response to stress. In addition, accumulating evidence suggests that as partners of CNC and Bach proteins, sMafs are involved in the onset and progression of various human diseases, including neurodegeneration, arteriosclerosis and cancer. 1 2 3 4 Kataoka K, Igarashi K, Itoh K, Fujiwara KT, Noda M, Yamamoto M, Nishizawa M (Apr 1995). "Small Maf proteins heterodimerize with Fos and may act as competitive repressors of the NF-E2 transcription factor". Molecular and Cellular Biology. 15 (4): 2180–90. doi:10.1128/mcb.15.4.2180. PMC 230446 . PMID 7891713. 1 2 "Entrez Gene: MAFG v-maf musculoaponeurotic fibrosarcoma oncogene homolog G (avian)". 1 2 Fujiwara KT, Kataoka K, Nishizawa M (Sep 1993). "Two new members of the maf oncogene family, mafK and mafF, encode nuclear b-Zip proteins lacking putative trans-activator domain". Oncogene. 8 (9): 2371–80. PMID 8361754. ↑ Petryszak R, Burdett T, Fiorelli B, Fonseca NA, Gonzalez-Porta M, Hastings E, Huber W, Jupp S, Keays M, Kryvych N, McMurry J, Marioni JC, Malone J, Megy K, Rustici G, Tang AY, Taubert J, Williams E, Mannion O, Parkinson HE, Brazma A (Jan 2014). "Expression Atlas update--a database of gene and transcript expression from microarray- and sequencing-based functional genomics experiments". Nucleic Acids Research. 42 (Database issue): D926–32. doi:10.1093/nar/gkt1270. PMC 3964963 . PMID 24304889. ↑ Crawford DR, Leahy KP, Wang Y, Schools GP, Kochheiser JC, Davies KJ (1996). "Oxidative stress induces the levels of a MafG homolog in hamster HA-1 cells". Free Radical Biology & Medicine. 21 (4): 521–5. doi:10.1016/0891-5849(96)00160-8. PMID 8886803. 1 2 Katsuoka F, Motohashi H, Engel JD, Yamamoto M (Feb 2005). "Nrf2 transcriptionally activates the mafG gene through an antioxidant response element". The Journal of Biological Chemistry. 280 (6): 4483–90. doi:10.1074/jbc.M411451200. PMID 15574414. ↑ de Aguiar Vallim, TQ (2015). "AFG is a transcriptional repressor of bile acid synthesis and metabolism.". Cell Metab. 21: 298–310. doi:10.1016/j.cmet.2015.01.007. PMC 4317590 . PMID 25651182. 1 2 Igarashi K, Kataoka K, Itoh K, Hayashi N, Nishizawa M, Yamamoto M (Feb 1994). "Regulation of transcription by dimerization of erythroid factor NF-E2 p45 with small Maf proteins". Nature. 367 (6463): 568–72. doi:10.1038/367568a0. PMID 8107826. ↑ Johnsen O, Murphy P, Prydz H, Kolsto AB (Jan 1998). "Interaction of the CNC-bZIP factor TCF11/LCR-F1/Nrf1 with MafG: binding-site selection and regulation of transcription". Nucleic Acids Research. 26 (2): 512–20. doi:10.1093/nar/26.2.512. PMC 147270 . PMID 9421508. 1 2 Itoh K, Chiba T, Takahashi S, Ishii T, Igarashi K, Katoh Y, Oyake T, Hayashi N, Satoh K, Hatayama I, Yamamoto M, Nabeshima Y (Jul 1997). "An Nrf2/small Maf heterodimer mediates the induction of phase II detoxifying enzyme genes through antioxidant response elements". Biochemical and Biophysical Research Communications. 236 (2): 313–22. doi:10.1006/bbrc.1997.6943. PMID 9240432. ↑ Kobayashi A, Ito E, Toki T, Kogame K, Takahashi S, Igarashi K, Hayashi N, Yamamoto M (Mar 1999). "Molecular cloning and functional characterization of a new Cap'n' collar family transcription factor Nrf3". The Journal of Biological Chemistry. 274 (10): 6443–52. doi:10.1074/jbc.274.10.6443. PMID 10037736. 1 2 Oyake T, Itoh K, Motohashi H, Hayashi N, Hoshino H, Nishizawa M, Yamamoto M, Igarashi K (Nov 1996). "Bach proteins belong to a novel family of BTB-basic leucine zipper transcription factors that interact with MafK and regulate transcription through the NF-E2 site". Molecular and Cellular Biology. 16 (11): 6083–95. doi:10.1128/mcb.16.11.6083. PMC 231611 . PMID 8887638. ↑ Kataoka K, Igarashi K, Itoh K, Fujiwara KT, Noda M, Yamamoto M, Nishizawa M (Apr 1995). "Small Maf proteins heterodimerize with Fos and may act as competitive repressors of the NF-E2 transcription factor". Molecular and Cellular Biology. 15 (4): 2180–90. doi:10.1128/mcb.15.4.2180. PMC 230446 . PMID 7891713. ↑ Kurokawa H, Motohashi H, Sueno S, Kimura M, Takagawa H, Kanno Y, Yamamoto M, Tanaka T (Dec 2009). "Structural basis of alternative DNA recognition by Maf transcription factors". Molecular and Cellular Biology. 29 (23): 6232–44. doi:10.1128/MCB.00708-09. PMC 2786689 . PMID 19797082. 1 2 Otsuki A, Suzuki M, Katsuoka F, Tsuchida K, Suda H, Morita M, Shimizu R, Yamamoto M (Feb 2016). "Unique cistrome defined as CsMBE is strictly required for Nrf2-sMaf heterodimer function in cytoprotection". Free Radical Biology & Medicine. 91: 45–57. doi:10.1016/j.freeradbiomed.2015.12.005. PMID 26677805. ↑ Friling RS, Bensimon A, Tichauer Y, Daniel V (Aug 1990). "Xenobiotic-inducible expression of murine glutathione S-transferase Ya subunit gene is controlled by an electrophile-responsive element". Proceedings of the National Academy of Sciences of the United States of America. 87 (16): 6258–62. doi:10.1073/pnas.87.16.6258. PMC 54512 . PMID 2166952. ↑ Rushmore TH, Morton MR, Pickett CB (Jun 1991). "The antioxidant responsive element. Activation by oxidative stress and identification of the DNA consensus sequence required for functional activity". The Journal of Biological Chemistry. 266 (18): 11632–9. PMID 1646813. ↑ Mignotte V, Eleouet JF, Raich N, Romeo PH (Sep 1989). "Cis- and trans-acting elements involved in the regulation of the erythroid promoter of the human porphobilinogen deaminase gene". Proceedings of the National Academy of Sciences of the United States of America. 86 (17): 6548–52. doi:10.1073/pnas.86.17.6548. PMC 297881 . PMID 2771941. ↑ Romeo PH, Prandini MH, Joulin V, Mignotte V, Prenant M, Vainchenker W, Marguerie G, Uzan G (Mar 1990). "Megakaryocytic and erythrocytic lineages share specific transcription factors". Nature. 344 (6265): 447–9. doi:10.1038/344447a0. PMID 2320113. ↑ Newman JR, Keating AE (Jun 2003). "Comprehensive identification of human bZIP interactions with coiled-coil arrays". Science. 300 (5628): 2097–101. doi:10.1126/science.1084648. PMID 12805554. 1 2 3 Shavit JA, Motohashi H, Onodera K, Akasaka J, Yamamoto M, Engel JD (Jul 1998). "Impaired megakaryopoiesis and behavioral defects in mafG-null mutant mice". Genes & Development. 12 (14): 2164–74. doi:10.1101/gad.12.14.2164. PMC 317009 . PMID 9679061. ↑ Shivdasani RA, Rosenblatt MF, Zucker-Franklin D, Jackson CW, Hunt P, Saris CJ, Orkin SH (Jun 1995). "Transcription factor NF-E2 is required for platelet formation independent of the actions of thrombopoietin/MGDF in megakaryocyte development". Cell. 81 (5): 695–704. doi:10.1016/0092-8674(95)90531-6. PMID 7774011. 1 2 Katsuoka F, Motohashi H, Ishii T, Aburatani H, Engel JD, Yamamoto M (Sep 2005). "Genetic evidence that small maf proteins are essential for the activation of antioxidant response element-dependent genes". Molecular and Cellular Biology. 25 (18): 8044–51. doi:10.1128/MCB.25.18.8044-8051.2005. PMC 1234339 . PMID 16135796. ↑ Fang M, Ou J, Hutchinson L, Green MR (Sep 2014). "The BRAF oncoprotein functions through the transcriptional repressor MAFG to mediate the CpG Island Methylator phenotype". Molecular Cell. 55 (6): 904–15. doi:10.1016/j.molcel.2014.08.010. PMC 4170521 . PMID 25219500. 1 2 Katsuoka F, Motohashi H, Tamagawa Y, Kure S, Igarashi K, Engel JD, Yamamoto M (Feb 2003). "Small Maf compound mutants display central nervous system neuronal degeneration, aberrant transcription, and Bach protein mislocalization coincident with myoclonus and abnormal startle response". Molecular and Cellular Biology. 23 (4): 1163–74. doi:10.1128/mcb.23.4.1163-1174.2003. PMC 141134 . PMID 12556477. 1 2 Agrawal SA, Anand D, Siddam AD, Kakrana A, Dash S, Scheiblin DA, Dang CA, Terrell AM, Waters SM, Singh A, Motohashi H, Yamamoto M, Lachke SA (Jul 2015). "Compound mouse mutants of bZIP transcription factors Mafg and Mafk reveal a regulatory network of non-crystallin genes associated with cataract". Human Genetics. 134 (7): 717–35. doi:10.1007/s00439-015-1554-5. PMC 4486474 . PMID 25896808. 1 2 Onodera K, Shavit JA, Motohashi H, Yamamoto M, Engel JD (Mar 2000). "Perinatal synthetic lethality and hematopoietic defects in compound mafG::mafK mutant mice". The EMBO Journal. 19 (6): 1335–45. doi:10.1093/emboj/19.6.1335. PMC 305674 . PMID 10716933. 1 2 3 Yamazaki H, Katsuoka F, Motohashi H, Engel JD, Yamamoto M (Feb 2012). "Embryonic lethality and fetal liver apoptosis in mice lacking all three small Maf proteins". Molecular and Cellular Biology. 32 (4): 808–16. doi:10.1128/MCB.06543-11. PMC 3272985 . PMID 22158967. Bonaldo MF, Lennon G, Soares MB (Sep 1996). "Normalization and subtraction: two approaches to facilitate gene discovery". Genome Research. 6 (9): 791–806. doi:10.1101/gr.6.9.791. PMID 8889548. Johnsen O, Skammelsrud N, Luna L, Nishizawa M, Prydz H, Kolstø AB (Nov 1996). "Small Maf proteins interact with the human transcription factor TCF11/Nrf1/LCR-F1". Nucleic Acids Research. 24 (21): 4289–97. doi:10.1093/nar/24.21.4289. PMC 146217 . PMID 8932385. Toki T, Itoh J, Kitazawa J, Arai K, Hatakeyama K, Akasaka J, Igarashi K, Nomura N, Yokoyama M, Yamamoto M, Ito E (Apr 1997). "Human small Maf proteins form heterodimers with CNC family transcription factors and recognize the NF-E2 motif". Oncogene. 14 (16): 1901–10. doi:10.1038/sj.onc.1201024. PMID 9150357. Blank V, Kim MJ, Andrews NC (Jun 1997). "Human MafG is a functional partner for p45 NF-E2 in activating globin gene expression". Blood. 89 (11): 3925–35. PMID 9166829. Marini MG, Chan K, Casula L, Kan YW, Cao A, Moi P (Jun 1997). "hMAF, a small human transcription factor that heterodimerizes specifically with Nrf1 and Nrf2". The Journal of Biological Chemistry. 272 (26): 16490–7. doi:10.1074/jbc.272.26.16490. PMID 9195958. Blank V, Knoll JH, Andrews NC (Aug 1997). "Molecular characterization and localization of the human MAFG gene". Genomics. 44 (1): 147–9. doi:10.1006/geno.1997.4847. PMID 9286713. Dhakshinamoorthy S, Jaiswal AK (Dec 2000). "Small maf (MafG and MafK) proteins negatively regulate antioxidant response element-mediated expression and antioxidant induction of the NAD(P)H:Quinone oxidoreductase1 gene". The Journal of Biological Chemistry. 275 (51): 40134–41. doi:10.1074/jbc.M003531200. PMID 11013233. Kataoka K, Yoshitomo-Nakagawa K, Shioda S, Nishizawa M (Jan 2001). "A set of Hox proteins interact with the Maf oncoprotein to inhibit its DNA binding, transactivation, and transforming activities". The Journal of Biological Chemistry. 276 (1): 819–26. doi:10.1074/jbc.M007643200. PMID 11036080. Hung HL, Kim AY, Hong W, Rakowski C, Blobel GA (Apr 2001). "Stimulation of NF-E2 DNA binding by CREB-binding protein (CBP)-mediated acetylation". The Journal of Biological Chemistry. 276 (14): 10715–21. doi:10.1074/jbc.M007846200. PMID 11154691. Kusunoki H, Motohashi H, Katsuoka F, Morohashi A, Yamamoto M, Tanaka T (Apr 2002). "Solution structure of the DNA-binding domain of MafG". Nature Structural Biology. 9 (4): 252–6. doi:10.1038/nsb771. PMID 11875518. Dhakshinamoorthy S, Jaiswal AK (Aug 2002). "c-Maf negatively regulates ARE-mediated detoxifying enzyme genes expression and anti-oxidant induction". Oncogene. 21 (34): 5301–12. doi:10.1038/sj.onc.1205642. PMID 12149651. Tramier M, Gautier I, Piolot T, Ravalet S, Kemnitz K, Coppey J, Durieux C, Mignotte V, Coppey-Moisan M (Dec 2002). "Picosecond-hetero-FRET microscopy to probe protein-protein interactions in live cells". Biophysical Journal. 83 (6): 3570–7. doi:10.1016/S0006-3495(02)75357-5. PMC 1302432 . PMID 12496124. Yamamoto T, Kyo M, Kamiya T, Tanaka T, Engel JD, Motohashi H, Yamamoto M (Jun 2006). "Predictive base substitution rules that determine the binding and transcriptional specificity of Maf recognition elements". Genes to Cells. 11 (6): 575–91. doi:10.1111/j.1365-2443.2006.00965.x. PMID 16716189.